When Twitter user @UnusualFacts6 posted the image below, it was supposed to be just what it said on the label — an unusual fact. 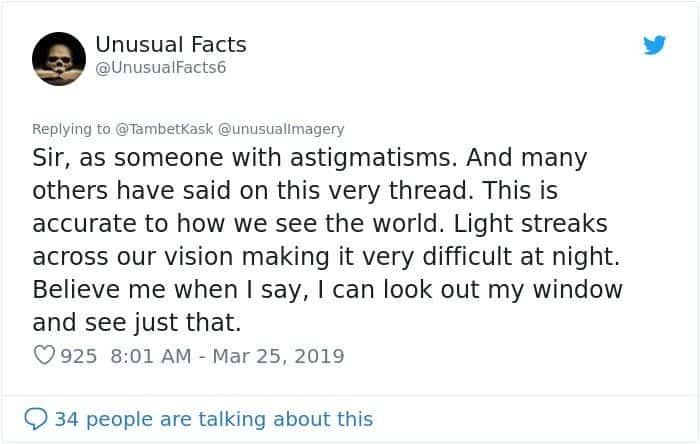 But this visual depiction of what astigmatism looks like had people realizing they might be suffering from the eye condition. Left is astigmatism. Right is normal. Image credits: UnusualFacts7 / Twitter. Your eye should be generally shaped like a round ball — but with astigmatism, it’s shaped more like a rugby ball. As a result, light gets focused in more than one place in the eye. Astigmatism can cause blurred vision, eye strain, and even headaches, and it typically occurs alongside short sight or long sight. It’s still quite common, however — in the United States, it occurs in 1 out of 3 people. It’s usually a very treatable condition, easily corrected with glasses or contact lenses, but it still helps to catch it early. But what if you don’t know you have it? This is one of those lovely internet moments, where a viral image makes an actual difference in people’s lives. 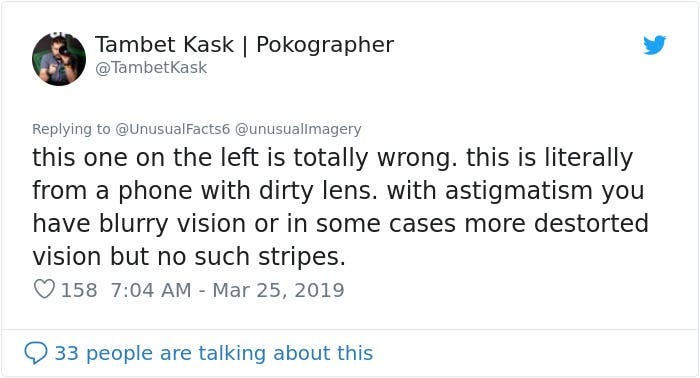 The left-hand image shows how people with astigmatism experience traffic lights — and many people with astigmatism were surprised in the comments. Some were quick to criticize and say that the image on the left is not accurate and merely represents a camera effect. Of course, that’s technically true — but it’s still an accurate depiction of how people with astigmatism see traffic lights. So there you have it — an unusual, but very effective way of diagnosing astigmatism. Do you have it? If you do see traffic lights like the image on the left, you should probably consult with an ophthalmologist. Refractive conditions such as astigmatism are the most common of the ocular problems among all age groups. According to the World Health Organization, they are also the first cause of visual impairments and the second cause of visual loss worldwide, accounting for 43% of global visual impairments are due to refractive errors. 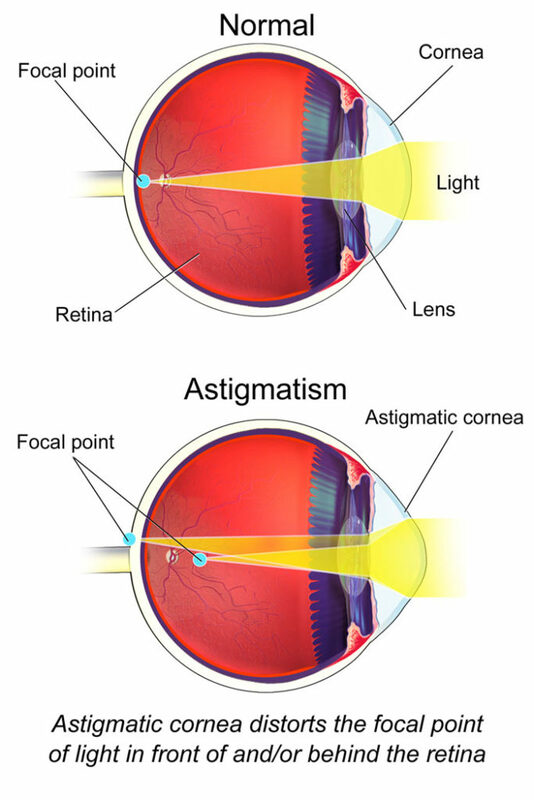 Astigmatism is one of the least severe such conditions.